According to a leaked internal memo from Facebook VP of production engineering and security Pedro Canahuati, the company is "working closely" with Apple to reinstate Enterprise Certificate privileges that were revoked on Wednesday. That information lines up with a summary of the situation provided by AppleInsider sources. The memo, obtained by Business Insider, seeks to ensure employees that Facebook is working diligently to restore access to an internal version of Facebook's iOS app, as well as private versions of Workplace Chat, Instagram and Messenger. For now, the company urges employees to download public releases of those same apps. Still, with Apple's lockdown in place, Facebook workers are unable to use apps like Mobile Home and Ride, both of which are not distributed publicly. Facebook employees vented their frustration over the situation in statements to Business Insider, saying that colleagues are "pissed" and "angry." Some hold Facebook responsible for running afoul of Apple's enterprise developer ruleset, while others pin the blame on Apple. "Apple is technically doing their job and has a right," an employee said. "This is probably one of the worse things that can happen to the company internally." Others have given in to conspiracy theories, with one employee summarizing Apple's decision as a long-awaited move to "take Facebook down." Apple CEO Tim Cook has long railed against companies like Facebook and Google, businesses based on the collection and marketing of customer data. The hubbub kicked off with a Tuesday report from TechCrunch that revealed Facebook paid users to install a VPN onto their iOS devices in a bid to monitor usage patterns. 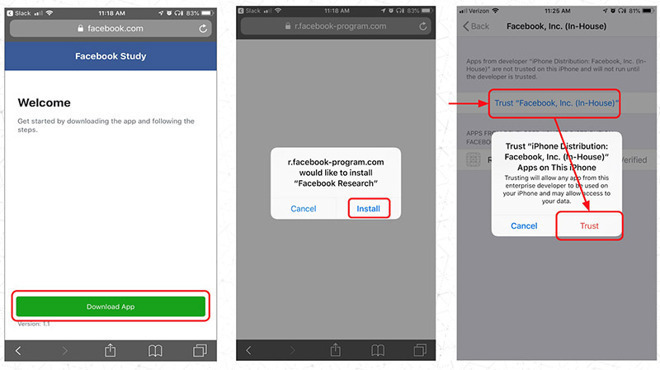 Called Facebook Research, the program used Apple Enterprise Developer Certificates to enable sideloading through three third-party beta testing platforms and root access into a user's device. In response, Apple pulled Facebook's enterprise certificates, a decision that seriously hinders not only Facebook's iOS app development, but also its regular operating infrastructure. What do the employees expect? There was obviously some shady stuff going on. Apple is very explicit in their user agreement for enterprise certificates. They have certificates for just such an occasion as this vs. not requiring them at all. One of the main rules in the agreement is apps are not allowed to be used by anyone outside if the company. They usually check that with an email address. I went through this with a very close Apple partner in 2011 for this rule on an internal iPad application. We were in the wrong, Apple was in the right. I'm sure Apple didn't take this whole thing lightly. Way to go Apple. My security is important to me even though I still use Facebook to sell items locally on the platform's marketplace. It seems to me Facebook had this coming and I'm not sure how, after all the other security issues they've been questioned on, they can honestly regain Apple's trust. We'll see, but this could be the beginning of the end to the end user of Facebook on Apple devices. This has to be one of the most amusing stories I've read for a while. Despite being a user of Facebook, I've always been suspicious of their privacy model and never give in to their incessant badgering to reveal personal information about myself, such as my address, phone number, school, etc. I won't even tag locations in photos. The sooner Facebook gets a bloody nose the better. They're riding roughshod over the norms of decent behaviour. And yes, Apple should create their own alternative cross platform social network. Show Farcebook how to do privacy properly. Good move apple. You are the best green computer company! That’s funny. I thought Apple only revoked the certificates used for their VPN App - not all their certificates including ones they use for internal Apps. I think this time they used their internal Enterprise certificate, and paid customers to install apps using that certificate. So Apple enforced its agreement. Given in the scale of things enterprise accounts are dirt cheap why didn't each division have their own account and certificate? Would have insulated them from another department going rouge. This is the least of the punishments Apple should be inflicting on FB for this serious breach. FB should be on developer “probation” for several years after this, with strict extra oversight and audits, strict limits n enterprise certificates, privacy controls on its developers, and dev and tester background checks, for starters. I’m glad the company found a way to punish the guilty (the company) without hurting the innocent (the customers). I will say that Apple should have known this was going on given that they had to force FB to remove the original version of this VPN spyware from the App Store. Next step needs to be Zuckerberg having to come publicly to Apple HQ with hat in hand to beg for a lifting of the certificate embargo (with an action plan for reforms and new conditions on their agreement). Like many, I have Apple Enterprise credentials and they couldn't make it more clear that it's not intended for app distribution outside of a company. I'm astonished Facebook was doing this - time to get some grownups in to help run that company. It's coming! You heard it here first, Apple's iOS13 will be dedicated to make every Apple device we own 'anonymous' when connected to the internet. Our devices will just look like an iPhone or MacBook. Privacy is Apple's next big move! I could even see an iLife-like suite of Apps devoted to Privacy! I would even go farther, for iOS 13, facebook and its associated apps won't install and the existing ones can't work. facebook's balls needs to be smashed. This is the least of the punishments Apple should be inflicting on FB for this serious breach. At which point, after hearing £uckerberg’s lame ‘mea culpa’, Tim Cook would do a Steve Job throwback - “we have one more thing” and he’d whip out the all new Apple BFG. Queue Tony Montana “Say Hello to my little friend!” and POW. End scene. Serves them right. I was sad to see FB beat expectations on earnings too. Frankly, I’m not surprised that no one at Apple thought Facebook would sign off on becoming a pimp. At the same time, nobody mentions what is happening ing on the android side of things. Train still chumming along happily? Users totally aware of and being used to this kind of treatment? ios only problem? Yeah, I thought so. So from this can we assume that there’s a similar program running on Android, and that Facebook has no intention of shutting it down? Why would they? Google is hardly likely to complain about nefarious data collection, are they? FB employees are delusional if they blame Apple. Those young Facebook lemmings will remain delusional all day long if so asked with the kind of money they are making.